Unrestored pumps - I had expected Hershey to be similar to the pictures I have seen for Iowa Gas, except just spread out more. That was not the case. There were not many quality unrestored pumps available for sale. My first day was Thursday - maybe all of the good, unrestored pumps were snatched up on Wednesday. Anyway, this was the only disappointment I had. Restored pumps - I expected to see at least a couple of vendors with a truckload of restored pumps for sale - all different makes and models. Perhaps I missed it, but I did not see a vendor with more than a handful of restored pumps. Signs - definitely quite a few signs were available, with a lot of repops and fantasy signs that were not marked as such. Prices for real signs were high for the most part. Oil Cans - I'm not a can collector, but there seemed to be a decent selection. Display and Other Petro Stuff - there were some cool things, like the Sunoco display that was mentioned in another thread. Other than the sheer size of the event, the thing that really captured me was how much this is a social event. A lot of old and new friends having a great time together. I still think OldGas is the best place to network when looking to buy or sell pumps. Prices just seem to be lower than shows, auctions, & ebay. Jeff all your points are valid observations. The popularity of this hobby is definitely stressing the supply and as a result prices are going up and the selection is decreasing. Guys like Rob the pump guy, Tom Buckles and few others were wise in stashing pumps as they are going to get even harder to find in the future. To restore pumps and offer for sale is risky business. You have to take many more precautions when transporting and moving them around. 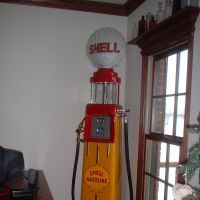 Plus it seems like when you are selling a texaco pump everyone wants a Shell and vice versa. Very little profit margin in restored pumps unless they are restored to order for a customer. Good clean signs always demand premium money...you can never go wrong buying mint ORIGINAL signs. In my opinion this hobby will continue to grow and set price records for many years to come yet. Bryce and Dave ..well said.. its the truth ! Always invest in the best even if its a bit too high now..5 years from now (if this trend keeps going)it will be worth 3 times more. I went once in 2012 and yes it is big but as far as buying there are a lot more reasonable places to search. Being on the west coast it will probably be a once in a lifetime opportunity for me.I thought our prices were high out here on signage but I think the east coast has us beat. for Jeff,,,, if you didn't go till Thursday, you missed a lot, trust me,, Miles Little goes there on Monday ( just like Iowa and Columbus ) and is driving around until Thursday buying everything good and he is all done by then.. I always go Tuesday,,, and go home Friday morning.. Maybe it doesn't look like a lot of pumps, thats because it's all spread out,,, don't forget it takes a lot of acreage to host 10,000 vendors. Compared to the other gas and oil shows. In fact you can't see all of it in 3 days. Last edited by Wes Hague; Sun Oct 12 2014 11:38 AM. I took the number of vendors into account and things being spread out. I just didn't see a single vendor with more than a 3 to 4 unrestored pumps. With the aura around Hershey, I incorrectly expected to see a couple of guys with a truckload of pumps. Well, next year he's going to have company. I'll be there early and won't make the same mistake as I did this year. Just the more reason to not make the long trip for bad results if some get in the day before. You mentioned Sunoco "display", are you referring to the Anty-Nok sign or was there more? I brought 7 unrestored. Cosy had about a dozen unrestored. For an auto swap meet there's a fair amount of pumps to be found. I just missed a complete Erie with top. A lot of being in the right place at the right time.